Wild Reactoids are attacking the Marie Curie Spaceport. 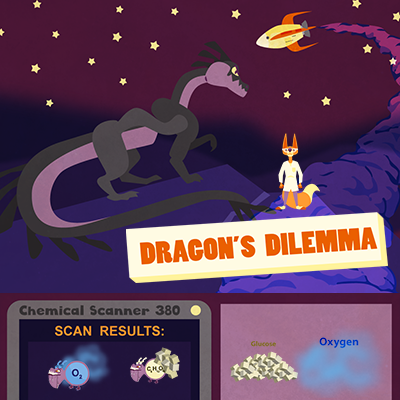 Dr. Fox must enlist the aid of a dragon to help, and along the way learns about chemical respiration. Dragon's Dilemma is meant to be a traveling game similar to Oregon Trail. It include 3 sections. An initial quiz section, a travel section and a combat section. Dragon's Dilemma was commissioned by Legends of Learning as a sequel to Chemical Crash. After we created the first game, they asked us to do another one a week later with a very short deadline for a different learning objective. We changed the story and added in some new graphics, and delivered in full. This game was designed to run on an Apple Ipad 2 with WebGL and older computers, with a maximum footprint of 30mb. In order to meet these requirements, we refrained from using large numbers of objects, heavy physics, and particle effects. This game was designed for the Legends of Learning educational company and is included here as a portfolio piece. Dragon's Dilemma was created in under 20 hours. It was designed to be played in a classroom setting with a playtime of 8-10 minutes. The gameplay was targeted towards 6th graders and teachers who were capable of operating an Ipad.